The natural beauty of concrete furniture is an appealing choice for pastoral landscapes. The high backrest and arms with a slightly curved seat and back create a distinct enduring look. 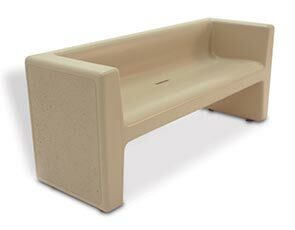 Tailor the bench with the extensive selection of color and finish options to provide that extra-splash of elegance. This skillfully molded 6' bench is reinforced with 3/8" steel rebar enhancing the innate strength of the concrete.